In an earlier story (The Sheriff Who Came to Dinner) Little John tricked the Sheriff of Nottingham into coming to dinner with Robin Hood. Before he left, they made him swear an oath never to harm them. In this story, the Sheriff decides to send Robin an invitation he cannot refuse. He holds an archery contest – and the prize is a golden arrow. He feels certain that the outlaw will not be able to resist taking part. Read by Natasha. Version by Bertie. Proofread by Claire Deakin. I’ve told you before how Robin Hood once tricked the Sheriff of Nottingham into coming to dinner with him in Greenwood. At the end of the dinner Robin forced the Sheriff to swear an oath never to harm Robin or his men. In this story, we shall hear if the Sheriff was true to his word. The Sheriff of Nottingham did not forget how Robin Hood had invited him to dinner under the trees of Greenwood. Some time after that memorable dinner, the Sheriff was drinking ale with his friend, the Abbot. The Sheriff smiled over the top of his tankard of frothy brown ale and the Abbot realised by the self-satisfied curl of his friend’s upper lip that the sheriff was confident of his plan. The Sheriff’s plan came quite naturally to him. Like most men, he loved to watch a good sporting contest. And in those days the most popular sport in England was archery. Everyone knew that the title for the finest archer in all the North of England belonged by right to Robin Hood. The Sheriff decided to give the outlaw a chance to claim his title. He ordered that on a certain day an archery contest would be held on the field outside the city walls. The trophy was to be a arrow, the like of which had not been seen in England. Its shaft was made of white gold, and it was tipped and feathered with yellow gold. When Robin heard news of the contest, he thought what a fine thing it would be to claim the prize from the hand of the Sheriff himself. The very idea made him chuckle, for all the people of Nottingham would see how their chief law keeper was powerless to arrest the county’s most notorious outlaw. The outlaws were far from overjoyed to hear this plan, for in their hearts, they thought it was perhaps a little too bold. On the day of the contest Robin and over 100 of his men gathered on the field of the contest. Robin ordered that just he and the five best shots in his band would take part in the match. The others were to crowd around them, so that Robin would not be recognised until he stepped forward to aim at the target. For more disguise, he wore a hood over his head. 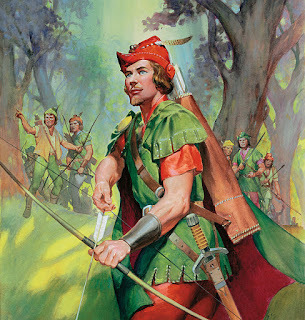 Little John, Much the Miller’s Son, and Will Scarlet each stepped forward in turn to aim their longbows. Their aims were good and true. Then it was the turn of Robin. Posts driven into a mound of earth served as the targets, and Robin split the furthest post with his arrow. Nobody else could strike true from such a great distance. At the end of the contest, Robin approached the sheriff to claim his prize. He accepted the golden arrow and held it above his head. The word had got round that the victor was none other than the most notorious outlaw in the North of England. Some people in the crowd cheered, others jeered, and still more kept quiet, for they did not dare to show their support or opposition for the Sheriff’s deadliest enemy. While Robin was still holding up the prize, a horn sounded and the sheriff’s men began to rush at Robin. The outlaws of Greenwood were ready for treachery such as this, and held their longbows bent and ready to fire. They shot their arrows into the sheriff’s men, and many of them fell dead. Then arrows began to fly in both directions and at most of the crowd. hose who did not care to join in the fight on either side ran for the city gates. A great many arrows were let loose, a great many tunics were split, and a great many men received wounds. An arrow struck Little John in the knee, and he was unable to stay standing. Much the Miller’s son added, “God forbid that we shall be parted”. He took Little John up on his back, and walked with him a mile, although he put him down every now and then to lose some arrows from his bow. All of Robin Hood’s men were retreating now. They fought their way to the castle of the good knight whom Robin had helped when he was down on his luck. It was a strong building, with a double moat and high walls. Once the whole band of outlaws were inside, the Knight ordered his guards to rise the drawbridge and shut all the gates. The Sheriff’s men surrounded the castle, but they were not strong enough to break their way in, and the Knight welcomed his old friend. After a while the Sheriff himself came up the gate carrying the white flag of truce, for he wished to negotiate. The knight stood on the walls to hear what he had to say. And that’s the story of Robin Hood and the Golden Arrow – and Bertie says that one day soon we shall hear about how Robin Hood met King Richard The Lion Heart.